Here’s a pretty great looking collaboration between these two artists of mammoth sounds. 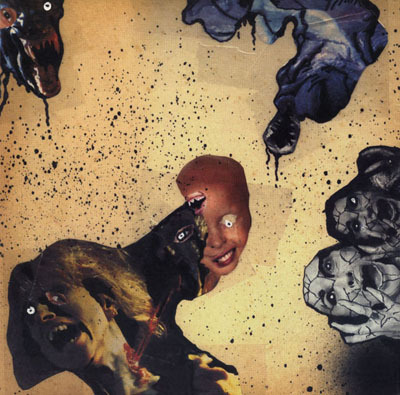 The artwork here is colorful, filthy collage work and contains a heavy vinyl record within. The sound is a really great mix between the staple qualities of both these artists and forms a thick layer of grit and grime on everything within listening distance. Side A, entitled: It’s exactly What You Think It Is is the more aggressive track here with slowly rotating drones that are absolutely soaked in distortion. Rising on high from soaring heights down to the utter depths of despair the oscillations are varied and changing. Yet there are moments of stasis here as well which allow the listener to sit back and sink into the crunchiness, only to appreciate the changes that are inevitable. Side B contains the title track and seems to start up where side A left off. This time with less synthesizer oscillations and more shifting walls of heavy distortion. The walls of distorted noise swirl around the main ebb and flow of overdriven feedback drones to form a multilayered bastion of hate. The sounds explore their given arena and present a focused character that includes more hollow industrial wails as well, before once again giving way to the harsh wall of overdriven torrents. I really enjoy the production quality here. The sound is intensly heavy representing highs and lows perfectly with a ton of mid-range crunch. The mix allows for varied levels of distance in the sounds, reverberations and industrial elements are able to scream and separate themselves from the mix only to become inundated by the intense distorted overdrive. The material stylistically reminds me a lot of Existence Establishment’s own BT.HN & Sistrenatus collaboration so if you are familiar with that sound at all I recommend you check this out. Great work from these two heavyweight artists defending their title.